Founded in 1959, the Gettysburg Battlefield Preservation Association is the oldest Civil War battlefield preservation organization in the nation. The GBPA has purchased and donated several hundred acres of land to the Gettysburg National Military Park. President Dwight D. Eisenhower was an early member and active supporter. Comedian Cliff “Charlie Weaver” Arquette and historian and author Bruce Catton were charter members. Today, the GBPA continues its mission to preserve our American heritage through land preservation & advocacy, living history programs, lectures, seminars, site tours, and support of Scouting. The GBPA includes these subsidiary programs working together to carry out its preservation and education missions. The Monuments Fund and its related Trust work to preserve and maintain battlefield monuments and markers commemorating the actions of Pennsylvania units and individuals during the Battle of Gettysburg. 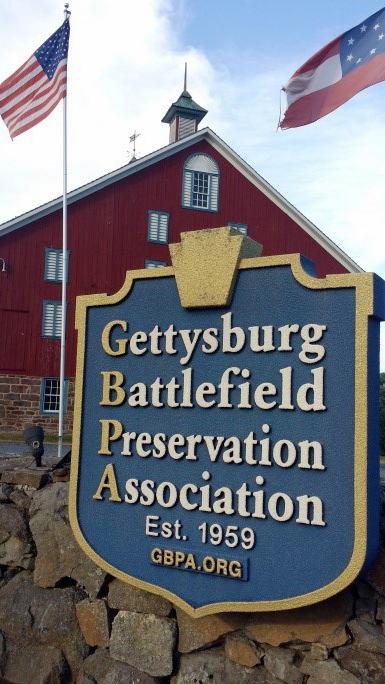 The entire GBPA membership is involved in preserving endangered battlefield land in Gettysburg. The Historic Daniel Lady Farm is bordered by Benner Hill, site of Confederate artillery that exchanged fire with Union artillery on Culp’s Hill during the battle, now part of the Gettysburg National Military Park. Bordering the farm on the North is the most threatened land in Gettysburg including the site of the U.S. Army General Hospital, set up after the battle, known as “Camp Letterman” or “Hospital Woods.” Other threatened battlefield sites bordering the farm include Grahams Confederate Battery and 2nd Corps troop movements in the attack on Culps Hill. “The Pennsylvania Gettysburg Monuments Project” is the generic term for the project founded by PA state Rep. Harry Readshaw. The representative had become concerned after reading a newspaper article about the state of deterioration of many of the monuments on the Gettysburg battlefield. Within weeks of its founding, the GBPA joined in the crusade to clean, maintain and repair monuments and markers on the Gettysburg Battlefield that honor PA Regiments and individuals. The GBPA now serves as administrator of the Monuments Project, including donations and fundraising receipts, and makes reasonable payments for fundraising event expenses, for the Monuments Project. All direct donations and unencumbered fundraising receipts are then transferred to the Monument Trust, or when circumstances necessitate, are granted directly to the Gettysburg National Military Park for emergency repairs to damaged Pennsylvania monuments. From educational events to Boy Scouts and other organized youth group camping. Venture Crew 1861 is part of the BSA New Birth of Freedom Council and is chartered by the GBPA. The Venture Crew accurately portrays a Civil War Fife and Drum Corps and Color Guard of the 1st Pennsylvania Reserves originally recruited in Gettysburg, York and Lancaster. The musicians also portray Johnson’s Division CSA fife and drum corps. Scouts and other organized youth groups may camp on hallowed ground on Gettysburg’s Historic Daniel Lady Farm. Reasonable rates apply. Many Scouts participate in the BSA Gettysburg Heritage Trail Award program while at the farm. Service projects and patches are also available. Educational events, and limited museum displays are housed in the house and barn of the Historic Daniel Lady Farm. GBPA merchandise is sold in our store in the barn’s milk house. Watch for a new facility to house these activities and offices as the GBPA expands its outreach and mission. Since 1999, the GBPA has owned, restored and operated the historic 146-acre Daniel Lady Farm at 986 Hanover Street (State Rt. 116) in Gettysburg. The farm served as Major General Edward Johnson’s staging area for the Confederate attack on Culp’s Hill, and was used as a Confederate Field Hospital during the battle. The Historic Daniel Lady Farm staff offers tours, camping for reenactors and scouts, living history demonstrations and educational workshops.